This would make a great momento of a trip to San Francisco. 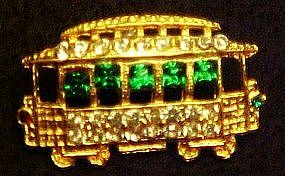 This little gold tone trolly is clustered with clear white rhinestones and square emerald color rhinestones. Measures 7/8" x 1 3/8". Perfect,like new condition.No flaking or missing stones. Unmarked.